Mesh eyelids were all the rage this week! I saw a bunch of people wear these, but I thought the eyelids looked huge and doll-like! I went ahead and purchase a set so I could play around with it, and also Iris’ mesh eyelids review on NWN convinced me that they would be a good investment now (she mentioned that SLink updates products, so maybe future versions will have more options). I re-sized the mesh eyelids smaller, and also pulled my Eye Depth slider to 0 for a better fit. Tinting the eyelids to match my skin was super easy. There is no HUD or script, so you just have to edit the prims and fill in a color from the color-picker. You can go with flesh tones or something more colorful to mimic eyeshadow. Overall, I like these. If you want to do a lot of close-eyed pictures without spending tons of time PS’ing, this is worth the money. It’s not super realistic looking, but definitely better than PS’ing. 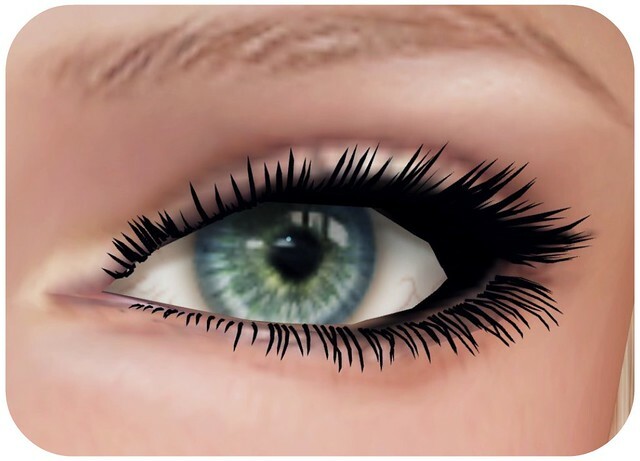 This mesh eyelids pack also comes with a pair of mesh lashes, which were difficult to fit because the lower & upper lashes are one prim so you couldn’t position them separately, and they didn’t look that fine (kinda spiky). I looove this outfit! This may be the cutest outfit I’ve work in a long time, it’s simple but so doll-like. Not sure how you made yours look so nice. I’m demoing right now and I just look like I have one swollen eye. No mod, so I cant resize, and when I click, not a whole lot happens. Perhaps I’ll wait. But the certainly look great on you! Yea, it’s too bad the demo didn’t have a resize option! That’s why it took me days to take the plunge, just cos I wanted to review it but I wasn’t sure if I would wear it more than once. Sorry Gogo – I tried joining the Truth subscriber via the board in-store but still can’t find trace of Bunny. Am I doing something wrong? I can’t find the Bunny hairstyle either. Are you sure it’s a Truth style? I sent a notecard to Truth Hawks to ask him, but I haven’t heard from him yet. Ohhhhh! I’ve been stalking your blog like a madwoman to see you review these. They look absolutely stunning on you, but how hard were they to color-match/size to fit? I think it looks more natural to just freeze frame, when the avatar closes it’s shape-eyes. So glad I found this inworld – thanks for showing it. I’ve bought every colour – such a cute outfit and at a steal of a price!